These guys have been such a pleasure to have around. I don’t know whether it’s the breed (Naked Necks) or just because there are ten of them (plus one future layer) but they are FUN. It’s been a few weeks since I’ve shown you pictures, so I’m putting them in chronological order, so you can see them grow. 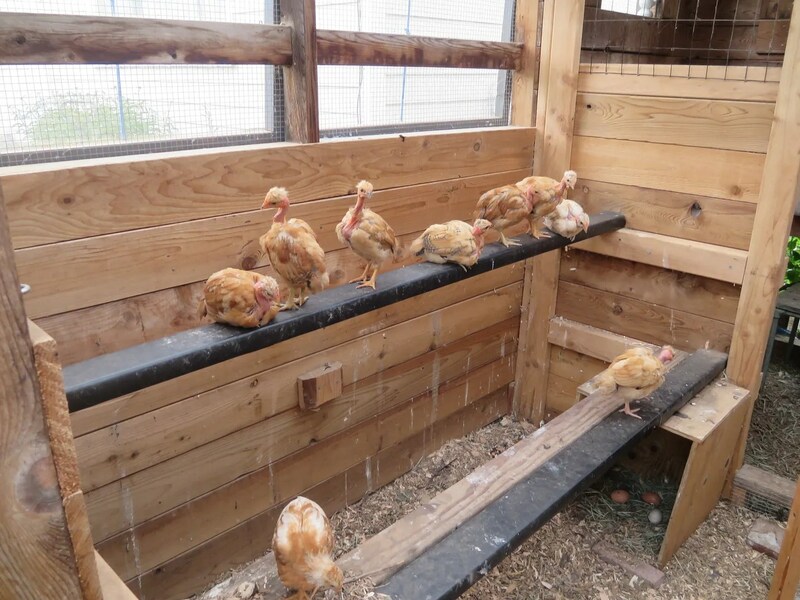 They still have a ways to go before they have their ‘one bad day’ as Joel Salatin puts it, but until then, they are having a ball. They are experimenting with the Big Girls’ perch – much to the dismay of the Ellie, my Welsummer who likes to go to bed early. 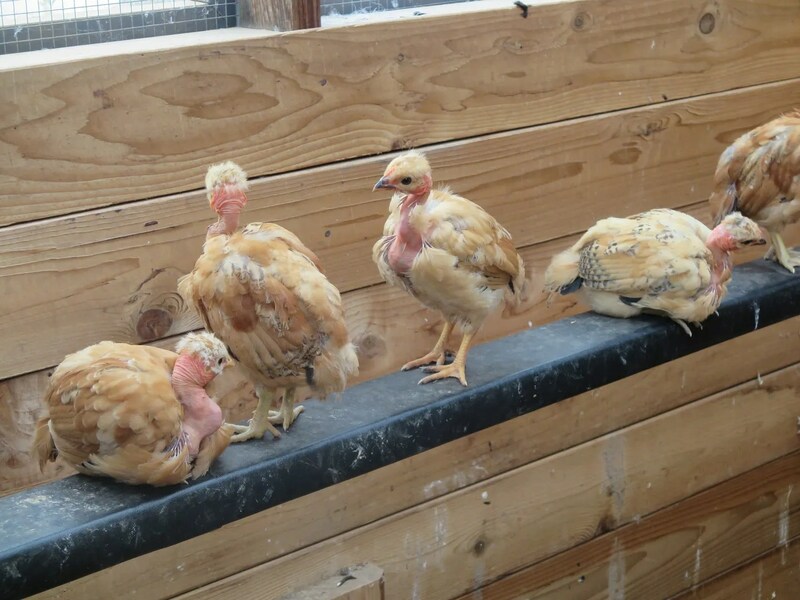 It’s simply impossible, she says, for a civilized hen to share a perch with such an uncivilized gang of youngsters. And just look at their necks! Are we sure they aren’t diseased??? 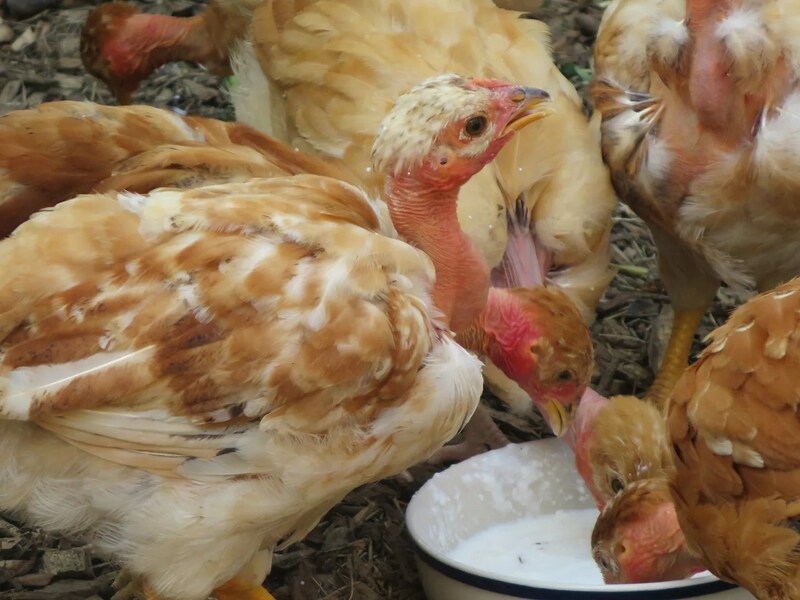 The babies love their kefir. Even the new future egg-layer, our Golden Sexlink. We have named her Matilda, Tilda for short. She is the sweetest little bird. I have to be very careful not to step on her, because she’s always right at my ankles. 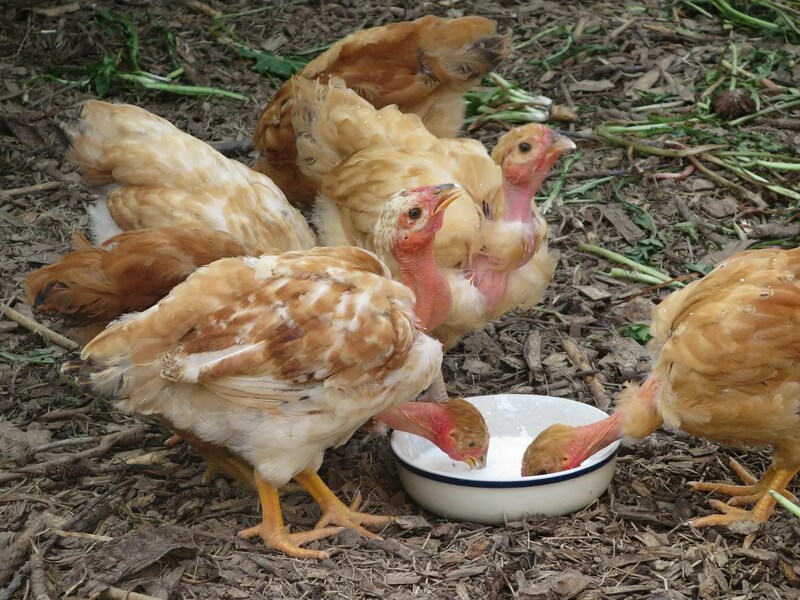 I haven’t socialized these meat birds much, because…well, they ARE meat birds. They aren’t scared of me (because I bring the food) but they don’t really want to be touched. Tilda does. Even though she was raised exactly the same, she started approaching me, and wanting affection – or at least extra treats! 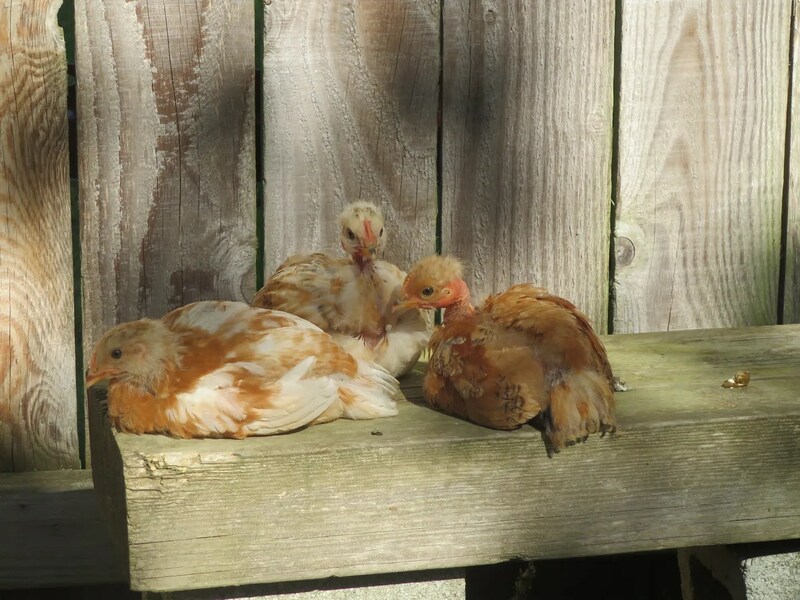 They love to sunbathe – they spend more time stretched out in the sun than any chickens I’ve ever raised. 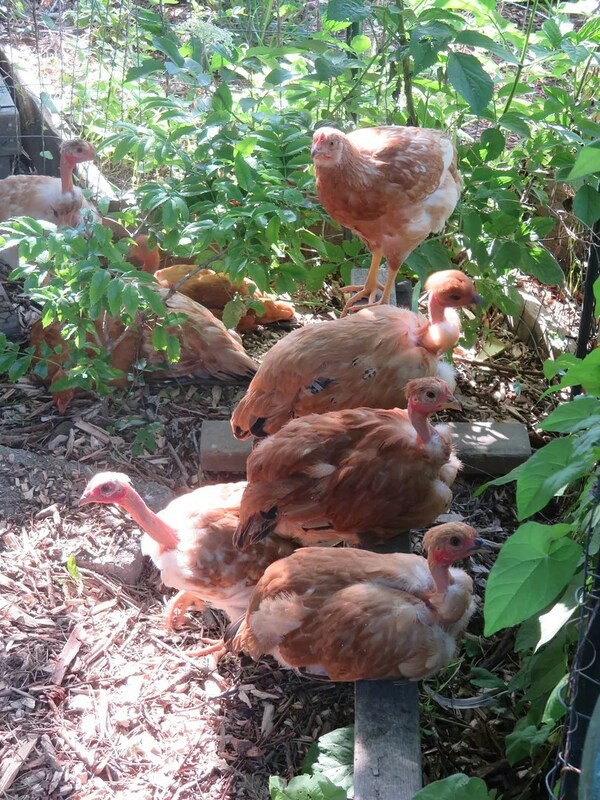 And when they are in the way back part of their yard, and they hear me coming with the fermented grain, it’s like having a little flock of velociraptors. They are fierce, when they run! Sometimes, it startles me…but always, it makes me laugh. I need to try and get a video of it. I did get a video of them drinking kefir. I just took this pic today. Relaxed, happy babies, just hanging out. 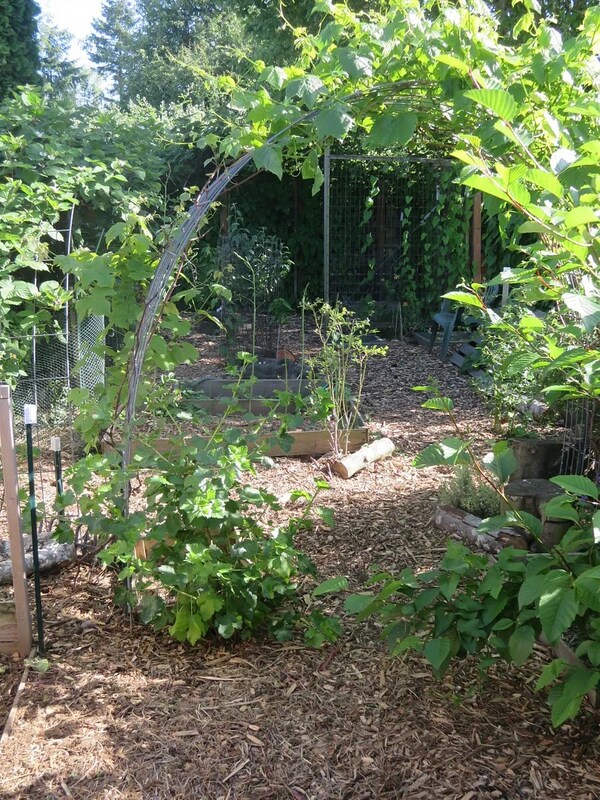 I have been working on planting the chicken areas with lots of future fruit sources: grapes, mulberry, blackberries, herbs, wolfberry, roses, apples, and many others. 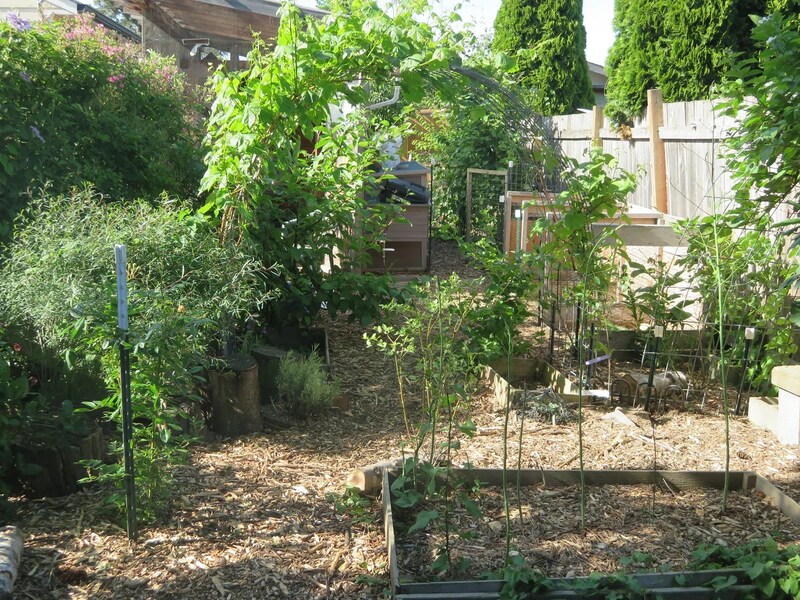 It’s really starting to look pretty nice, and the girls appreciate the greenery, even if it’s too soon for fruit. I have also spread a thick layer of wood chips out here. 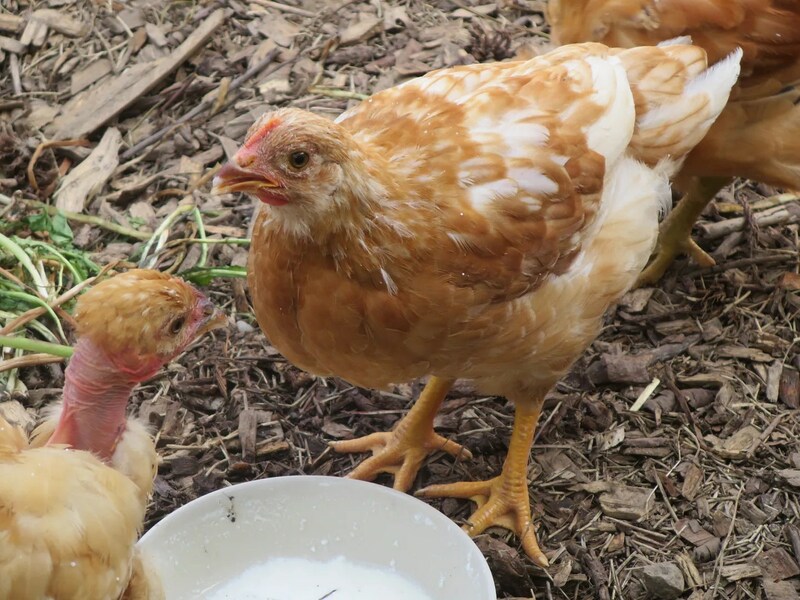 The chickens are not very fond of them when they are fresh – I don’t know if they don’t like the smell, or the prickliness of all the pine needles and twigs, but it prevents the ground from turning to mud in winter, and bare, dry, cracked earth in summer. Once the chips age a few months, they will be in here, constantly digging through it and finding tons of worms and bugs. Life on this fallen earth being what it is, for every joyful event, there’s a sad one. 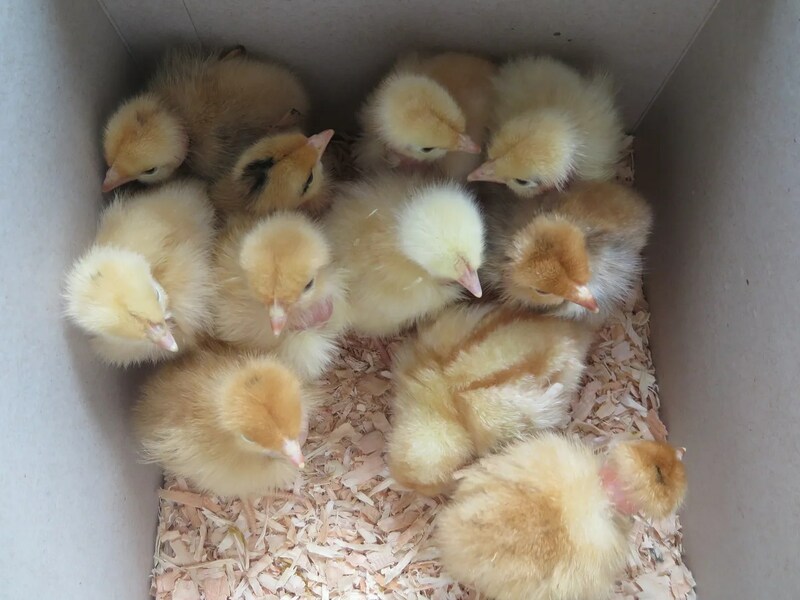 Today, we brought home a box of baby chicks…last week one of our original old hens died. 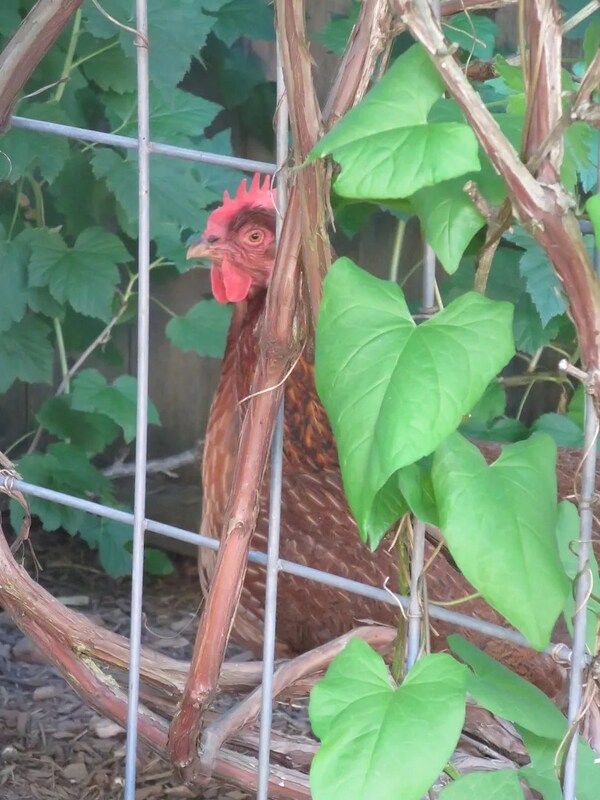 Antoinette, our Delaware, who lived up to her French name by loving to eat snails. She was feisty, and bossy, and the first one into everything new. For the last three years or so, she’d been having trouble with a bit of lameness that I was never able to discover a cause for. It didn’t slow her down much…other than being unable to jump up onto her roost at night. 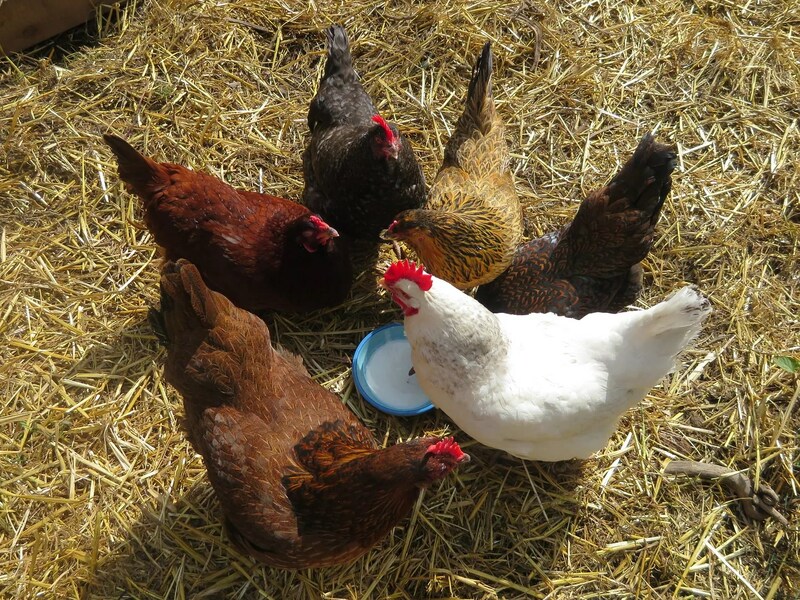 Her last day, she seemed fine, and it was a perfect day for a hen. She got to help me plant new trees in her yard – lots of tasty bugs and worms! – and later, she sunbathed with her sister. When it started to rain, I waited it out with her in the coop, so she had a lovely long snuggle…one of her favorite things in the world. And then, in the morning, she was just…gone. Dead, I think, of a heart attack or stroke. She was quite an old girl. She’ll be missed. But chicks! There is nothing like the happiness of bringing home a box full of babies! 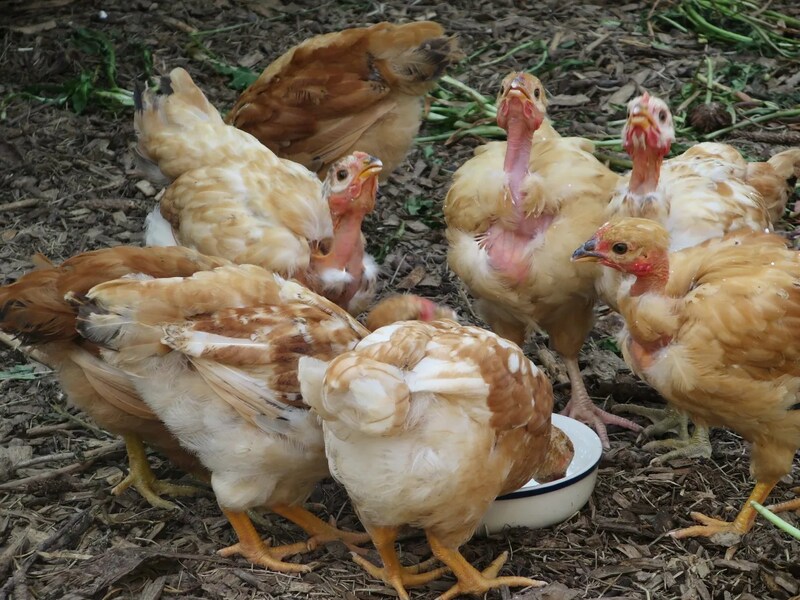 There are ten Naked Neck chicks in there, and one Golden Sexlink. 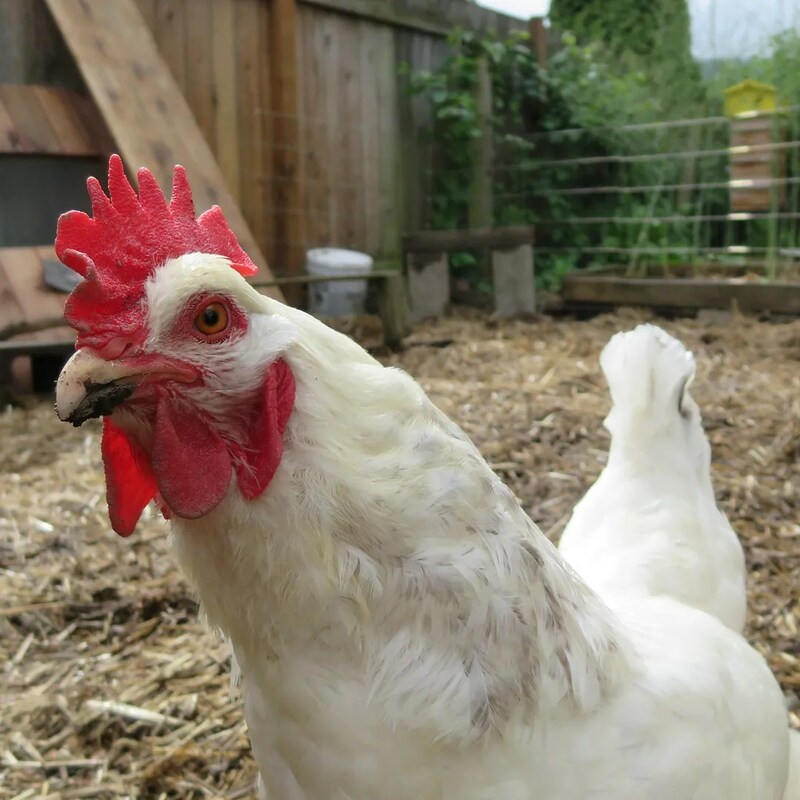 The Sexlink (name still to be chosen) will be joining the flock as a new egglayer. I’ve never had a Sexlink before, preferring the heritage breeds, but I’ve heard they are terrific winter layers – something my heritage breeds are not. This is a test. If she does well, I might keep a couple Sexlinks permanently in the flock. The Naked Necks are for meat. 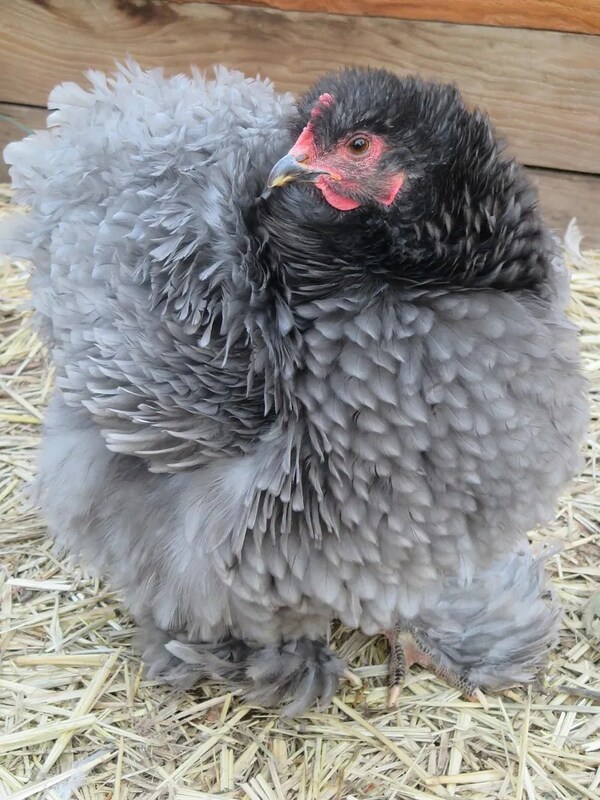 If I like this breed, I might try keeping a rooster and a few hens so I can produce my own chicks of this breed every year. 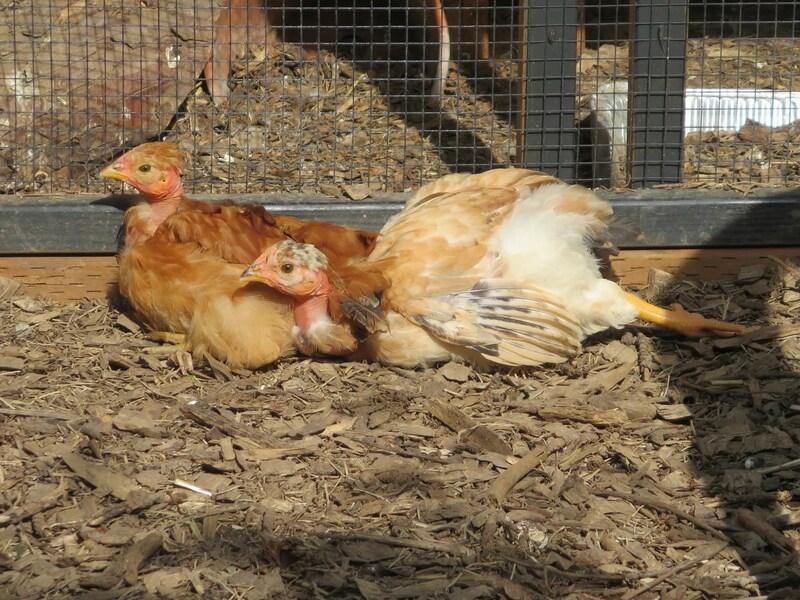 The new chicks are being foster-mothered by my grey Cochin, Ophelia. She was kind enough to go broody for the first time nearly EXACTLY two weeks before the store was stocking Naked Necks. We just put the babies underneath her, and she took to them instantly. I think she’s going to be a great mother – fingers crossed! It’s good she’s so big and soft and fluffy, since she has eleven babies to care for. The most we’ve ever given a broody before was four. It’s going to be so cute, when she starts taking them out and teaching them how to be chickens!